Habit: evergreen shrub, bark is gray with darker strips. The oval leaves are thick and shiny green with flat margins unlike Garrya elliptica where margins are wavy. 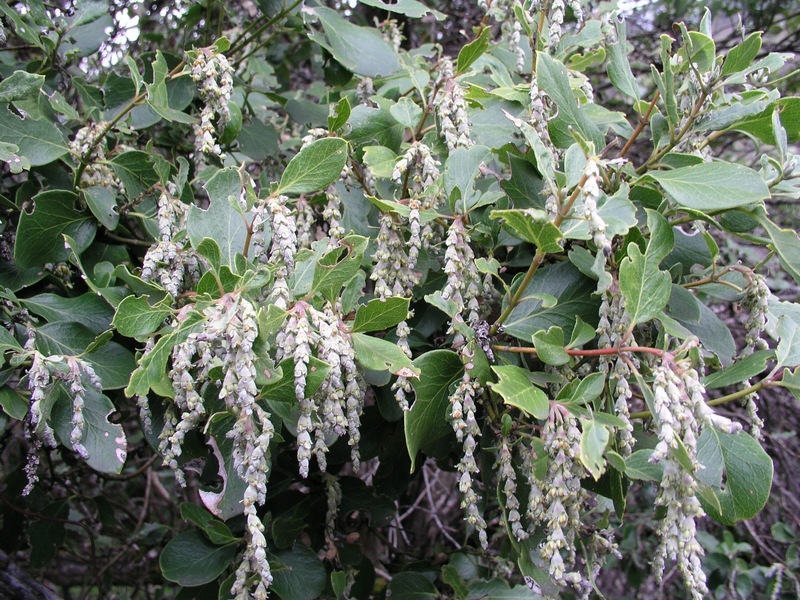 Flowers are on separate male and female plants producing long, hanging clusters of yellowish to pinkish flowered catkins both growing between 2-5 in (5-12 cm) long. The spherical berries ripen to blue-black and are somewhat persistent. Winter blooming between December and February. Ecology: ranging from Southern Washington through Oregon and into Southern California from elevations between 1000-7500 ft (300-2300 m) in chaparral woodlands, canyons and slopes, foothills, and mountain forests. Makes a good screen or part of a hedgerow. Provides cover for various birds and small mammals.